There is a magical cherry tree at Thomas’ grandma’s that bears two types of fruit from the same tree. Bing and Queen Anne cherries both grow on the tree. The neat thing about it is that Bing cherries are a typical bright red when ripe, but the Queen Anne cherries are a pale pink. I was so confused why half of the tree was “ripe” while the other half remained pink the first time I saw it and it took some serious convincing on Thomas’ part for me to believe that two types of cherry can grow from one tree. Amazing! There was a super plentiful crop this year and I have been processing cherries like it’s my job. I decided to throw a few in the dehydrator and I’m so glad I did – tasty! Wash and pit cherries. 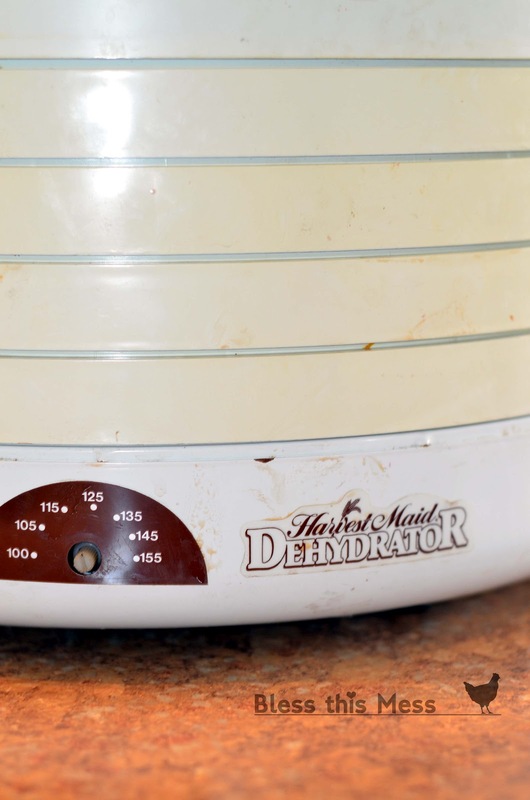 Spread in a single layer on your dehydrator racks, cover and turn on your dehydrator. Set the heat between 115 degrees and 135 degrees. Dehydrate until dark and shriveled but still give a little when touched (if you let them go until they are completely hard, then they are tough to eat and don’ t taste great). Remove cherries as they are done (mine took around 8 hours to dehydrate). Store in an air tight container in the fridge. We’ve been eating these plain like raisins (but much tastier), but I also plan to use them in some kind of oatmeal white chocolate cookie. 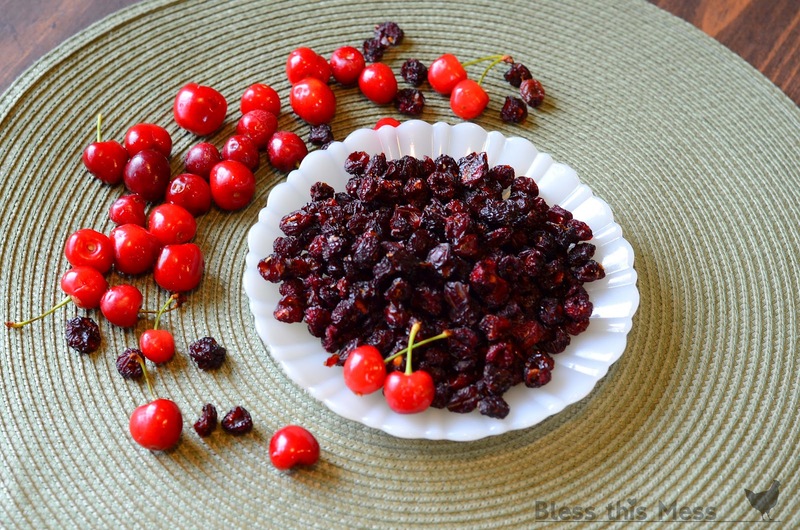 Sweet cherries are different from tart or pie cherries, so be sure to look for the sweet ones. My landlord (who’s also a chef at the lion house) got a degree in horticulture. We have a few hybrid trees in our backyard. One has plums, apricots, and I want to say pears and another grows three types of apples. The first year we lived here I thought I was going crazy but now I’ve learned as soon as the apricots are done I can look forward to plums. These cherries would be so yummy in granola I bet! do you have a problem with them sticking to the dehydrator? 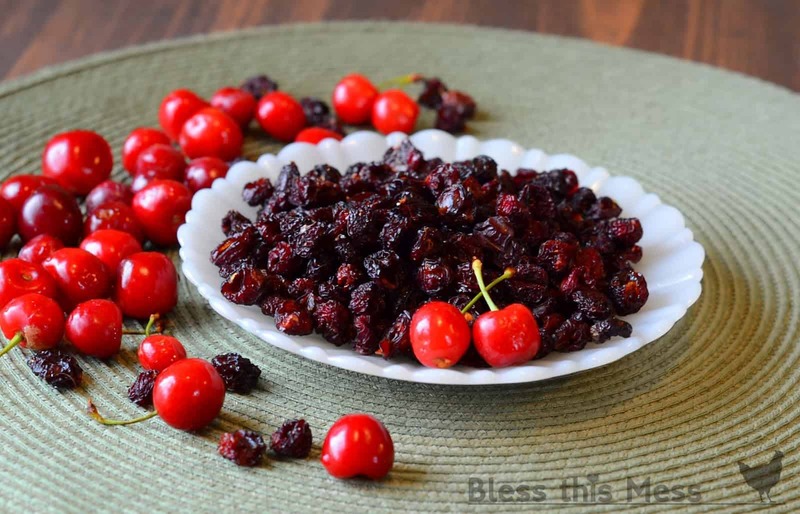 We have a cherry tree & I would LOVE to dehydrate the cherries (next year), but they always stick to our dehydrator. Also, I would love your ‘recipe’ (or do you just follow the blue book?) for canning cherries. what do you use your canned cherries for?